image of Bahamas Flamingo Cay, Jumentos. For a mere $16.99 on my iPhone, or, if I had one, an iPad, Navionic’s app rocks… mostly. Even in the Bahamas remote Jumento island of Flamingo Cay, I can view a pretty decent map with marked anchorages, though the all-important depths are not listed. For much more. 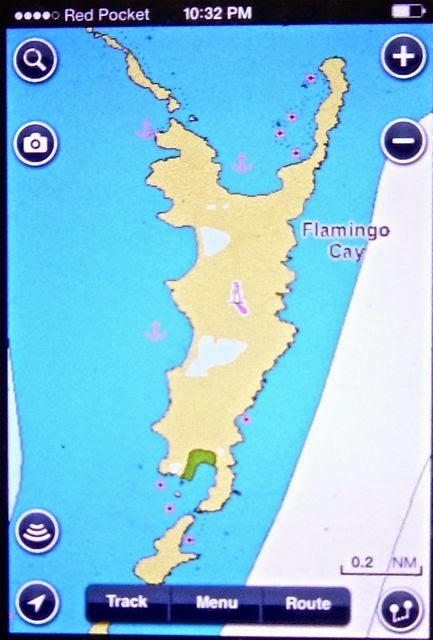 The Navionics chip for our Lowrance chart plotter display of Flamingo Island looks like an EKG mated with a simplistic toolbox of curveless geometric shapes. There is some crude similarity to Flamingo’s actual outline and just enough latitude and longitude to know where it’s situated, but that’s all. 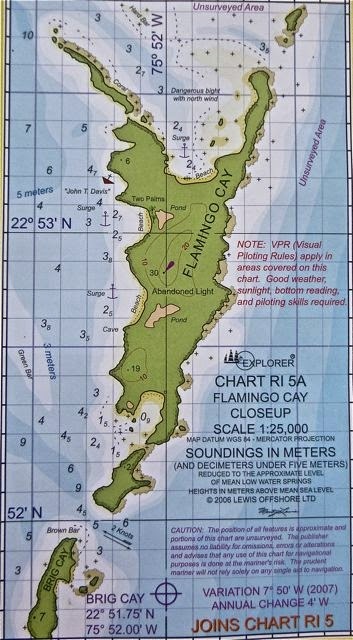 Crappy; this is how our chart plotter depicted Flamingo Cay. it would get tossed overboard. Funny, same company, in this instance, radically different charts. Guess the timing (our Navionics chip is older) and the medium ([old] iPhone  versus an older still Lowrance chart plotter [not sure its age -- came with the boat) makes a difference. 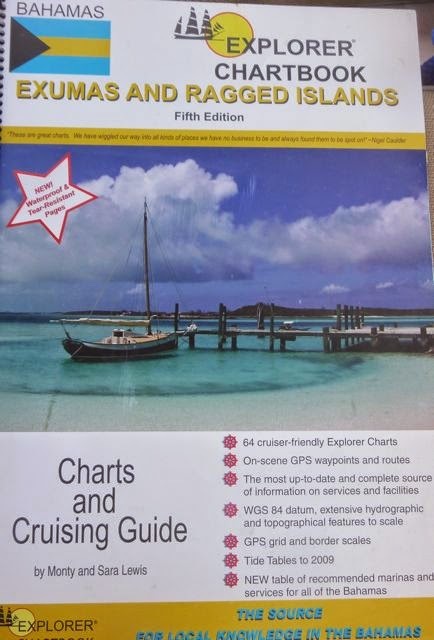 Thank goodness for our Explorer Chartbook of the Exumas and Ragged Islands. We get an accurate image of the island, its anchorages (including what kind of weather conditions are safe for each spot), and depth. Paper doesn’t “talk” to our autopilot, but it does at least provide the information we need to find out where we wanted to go and how to get there. their navigation series; they’ve steered us well. Redundancy; paper charts, electronic chartplotters and phone navigation backups. That combo keeps us afloat (and not aground). Ragged Islands Explorer Chart Book. Before next year’s South Pacific and beyond cruising season, we’ll relook at what we have (like recently purchased newer plotter chips) for each (perhaps a replacement for our Lowrance chart plotter). Like many wines, price is not always an accurate indicator of quality. 7 June 2014, BAHAMAS retrospective from March 2014 Jumentos, BAHAMAS. We are currently at JAX Naval Base Mulberry Marina (N30.12.980 W81.40.234) planning to soon drydock our boat for hurricane season in Green Cove Springs, FL. 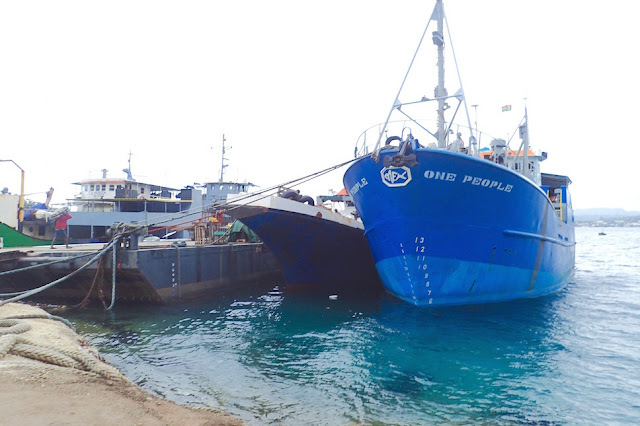 There is no shortage of unpublished photos and adventure stories to fill the gap between now and cruising season, though some are awaiting a long overdue iPhoto technical transfusion. 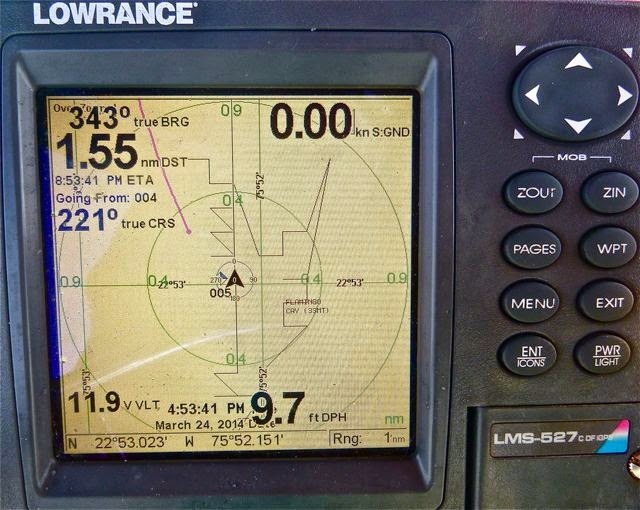 We have the latest navionics on our Raymarine e7 and I'm not impressed, but now they access NOAA charts, so all is well. 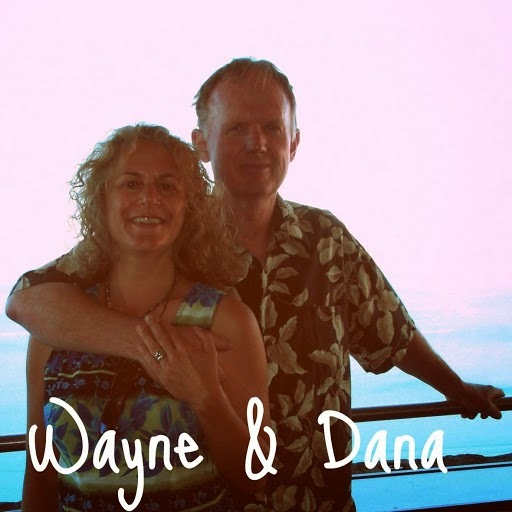 Deb is my backup with her iPad and Garmin charts, along with a Garmin handheld and an iPhone with Navionics and garmin. Phew. Yes, we have all the paper as well. Never go without paper charts. A compass, knotmeter, and paper charts will get you there when the satellite craps out. Sounds like you're good to go! We're getting there.